Santana Dotson marks the new longest TTM wait ever for me, at 5 years, 8 months, and 24 days. To say that I had given up on these a long time ago is an understatement, but when I saw that he was responding to a few fans recently through some boards, it gave me a glimmer of hope. Don’t get me wrong, I don’t like waiting years for autographs but this one tasted all the sweeter to get- and the older ones always bring back memories of what I was doing then and there at that time. I’d like to believe that Santana understands the TTM game in this respect, and with that I am glad to finally get his autograph on these two beautiful cards. I loved the creamsickle orange Bucs uniform. I will always say that every time I get one signed. The Action Packed 1992 Rookies card is pretty nice. Santana is blowing by an offensive lineman, and off the canvas. The card does a pretty good job of showcasing his impressive wingspan. I wasn’t too huge a fan of the Classic brand. They went from absolutely garish cards, to the very plain, no frills 1992 edition shrouded in black. Still, it’s a pretty good looking card. Rarely anymore do you see cards that have a player setting up in stance and this card looks great adorned with his autograph. The unique Baylor paws on the shoulders remind me of the dying days of the SWC. Santana was one of the last great dinosaurs coming out of Baylor during the final years of the SWC. Back in those days, Baylor almost always had a tenacious defense led by a powerful defensive line. Dotson clocked in at 6’5″, 265, and just wrecked havoc. A consensus All-American in 1991, Dotson had 6 tackles and 5 sacks in one game against Houston that year. Over 41 games at Baylor, he had 193 combined tackles, 30 TFL, 14 sacks, 2 fumble recoveries, and was a 3 time All-SWC selection. His quickness off the snap and versatility allowed Santana to play outside or kick inside on rushing downs. 1992 was not a particularly good draft for the Tampa Bay Buccaneers. While they did find some depth and some occasional starters, Dotson stands far and away as their best pick that year- selected in the 5th round. The Bucs plugged him away at right defensive tackle immediately where he started all 16 games his rookie season. He’d finish the year with 71 tackles, 2 forced fumbles, and 10 sacks- a club rookie record. In addition, Santana returned a 42 yard fumble for a TD against the Lions. 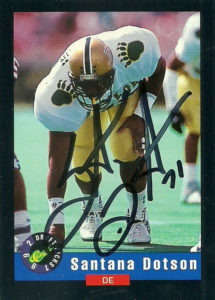 While he did not see the same measurement of success over the next 3 seasons in Tampa, Dotson was a nice free agent poach by the Green Bay Packers in 1996. Thus started the second phase of Sack-Tana’s career. Dotson helped anchor a Green Bay defense that was retooled under the new free agency rules. 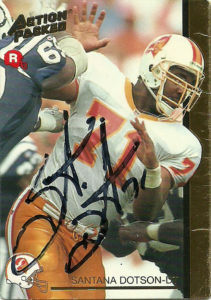 Playing alongside Reggie White, Sean Jones, and Gilbert Brown, Dotson solidified an already formidable defensive front. He had 26 sacks, 6 forced fumbles, and 158 tackles playing RDT over the next 6 seasons. A fan favorite in Green Bay, he helped the team win Super Bowl XXXI and appear again in Super Bowl XXXII.